Tata’s much-anticipated SUV, the Harrier, has created quite a stir thanks to its stunning design, Land Rover underpinnings and equipment list. Now that we’ve got our hands on the spec sheet of the Harrier, we can safely say that it’ll be a serious threat to other compact SUVs in the country. Expected to be priced between Rs 13 lakh to Rs 17 lakh, ex-showroom, the Harrier will compete against the best-selling Hyundai Creta, the Jeep Compass and the Mahindra XUV500. First up, let’s take a look at how these SUVs compare on the price chart. 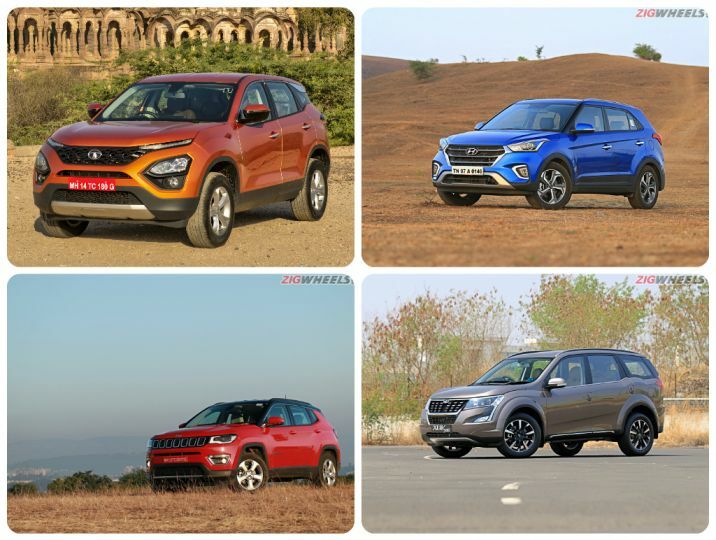 As you can see, the best-selling compact SUV, the Hyundai Creta, is the least expensive of the lot. This is partly because the Hyundai Creta is the smallest SUV here in terms of the exterior dimensions. The XUV500, despite being a seven-seater SUV that’s also available with AWD, is less expensive than the Jeep Compass. But, the Jeep has a sense of novelty that others can’t match, helping it command a premium which SUV lovers are willing to pay for. The Tata Harrier is expected to be priced between the Creta and the XUV500. Also, if you look closely, the most expensive variant of the Creta still costs less than the least expensive Jeep Compass! When it comes to the overall exterior dimensions, The five-seater Harrier pips the seven-seater XUV500 in terms of length and width. However, the XUV500 towers over the Harrier thanks to its 1,785mm height. In terms of the wheelbase and ground clearance however, it’s the Tata Harrier which betters the Compass, XUV500 and the Creta. This should give it a solid road presence when compared to others in the segment. While Tata is yet to reveal the dimensions of the Harrier’s interior, we’ll be measuring it shortly to let you know which of the four SUVs is the most spacious of the lot. On paper, it’s the Jeep Compass that has the most powerful engine. The Compass’ 2.0-litre diesel engine is in fact shared with the Tata Harrier, but the latter has been given a lower state of tune. At 140PS/350Nm, it makes 33PS less power and 10Nm less torque than the American SUV. And while the XUV500’s power figure falls in the middle of the two, the Creta is the least powerful with 12 fewer horses under the bonnet when compared to the Harrier. However, it’s worth mentioning that the least powerful Hyundai Creta is also the lightest in terms of the kerb weight, which should help it gain and shed speed quicker than the others. Safety 6 Airbags, ESP, ABS, EBD, TCS, Corner Stability Control, Roll Over Mitigation, Brake Disc Wiping, Hill Hold, Hill Descent and Front Fog Lamp with cornering function. 6 Airbags, Hill-start assist, ESC and Static bending lights. 6 Airbags, ABS, TCS, ESP, Panic Brake Assist, Hydraulic Boost Failure Compensation, Electronic Roll Mitigation and Cornering Fog Lamps 6 Airbags, ESP, Electronic Roll Mitigation, Tyre Pressure Monitoring System, ABS, Hill Hold and Hill Descent. When it comes to standout features, the least expensive SUV here is quite impressive. The Hyundai Creta packs all the creature comfort that one may need, including an automatic climate control, rear AC vents, a touchscreen infotainment system, steering-mounted controls and electrically adjustable driver seats. To top it all off, it gets a sunroof too! All of the SUVs here get a similar kit, but it's only the Hyundai Creta which gets a wireless phone charger. The Compass gets a panoramic sunroof as a standout feature, along with its 4x4 drivetrain and first-in-class frequency selective damping that can alter the suspension stiffness on small and larger bumps to offer a balanced ride. The XUV500, on the other hand, gets a first-in-class Blue Sense application that lets you control the climate control, audio, location services and emergency assists through a smartwatch. Not to forget, it is the only SUV here to offer seating for seven occupants. Finally,the Tata Harrier, on the other hand, gets an 8.8-inch high-resolution infotainment display and another 7-inch digital display built into the instrument cluster that relays loads of information, including a digital tachometer, navigation data, drive modes and various car-related information like an odometer, a trip meter, fuel gauge, instantaneous fuel efficiency and media playback. But, it does miss out on a sunroof which could be a deal breaker for many out there. Additionally, it gets an ESP-based drive mode selector that can alter the engine’s power delivery to suit wet and rough roads. In fact, it is the first 2WD SUV in India to feature this tech. The Harrier also gets other small safety touches like brake disc wiping which keeps water off the discs in wet conditions for better braking performance. All four SUVs featured here has something going for them. For the Tata Harrier, it’s the large dimensions, design and premium interiors. The Hyundai Creta is renowned for its fuel efficiency and value-for-money quotient. The Compass is backed up by Jeep’s 4x4 pedigree, while the XUV500 is the only here that can seat seven passengers. While we try to assemble all four SUVs for a thorough comparison, stay tuned to Zigwheels to find out what we feel about Tata’s latest SUV. Meanwhile, check out the links below to read more about the Harrier’s design and features.